Vibrational spectroscopic characteristics of melamine, cyanuric acid, and melamine cyanurate were measured using surface-enhanced Raman spectroscopy (SERS) coupled with gold nanosubstrates. Trace amounts of melamine and its analogues (cyanuric acid and melamine cyanurate) were characterized and quantified quickly and accurately by SERS in combination with partial least squares (PLS) analysis. Based on the relationship between the Raman intensity of the most prominent peak at around 676 cm−1 and log values of melamine concentrations, the limit of detection (LOD) of SERS for melamine was estimated to be 2.6 × 10−7 mol L−1 (∼33 ppb). An approximately 3 × 104 fold of enhancement factor for SERS signals of melamine on gold nanosubstrates was obtained. This result was based upon the comparison of the peak at around 676 cm−1 in the SERS spectra with that of normal Raman spectra of melamine in aqueous solutions. SERS spectra of cyanuric acid acquired from its solid form differ significantly from this compound in an aqueous solution, indicating a possible keto-enol isomerization reaction of cyanuric acid in water. When equal amounts of melamine and cyanuric acid were added together, spoke-like crystals of melamine cyanurate formed instantly, which could be measured and characterized by SERS. This study demonstrates that SERS could provide a fast and ultra-sensitive tool for detection and characterization of melamine and its derivative compounds in aqueous solutions. 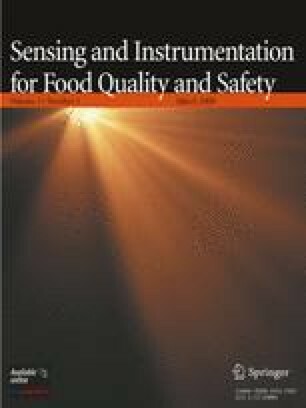 Special thanks are given to Dr. Barbara Rasco (Ph.D., JD) in the Department of Food Science at Washington State University for her kind review of this study.